Book Ferries to Athens Piraeus, Chania, Rhodes, Santorini, Naxos, Mykonos & More with Blue Star Ferries! You can use AFerry to book a Blue Star ferry to a huge range of Greek Islands including Crete, the Cyclades islands and the Dodecanese. Blue Star Ferries is one of the most well known and prestigious ferry companies operating in Greece and transports millions of tourists every year aboard their well equipped modern ferries to holidays in the Greek islands. AFerry always has cheap prices for Blue Star Ferries and the latest special offers. 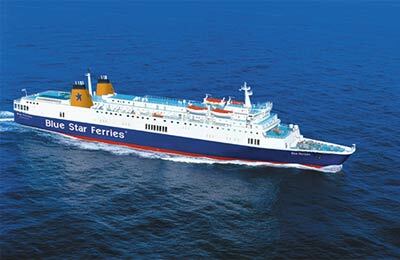 You can use AFerry to book Blue Star ferries to Athens Piraeus, Paros, Santorini, Kos, Naxos, Rhodes, Paros, Iraklia, Crete and many more Greek Islands. For all Blue Star Ferries routes and the latest prices and sailing times see below. Click on your ferry route for a detailed Blue Star Ferries schedule. If you book a Blue Star ferry you will travel on one of their eight modern air-conditioned ferries which all offer a full range of on board facilities. The Blue Star 1, the Blue Star 2, the Blue Star Paros, the Blue Star Naxos, the Blue Star Ithaki, the Superferry II, the Blue Horizon and the Diagoras. On board these ferries, as well as a range of cabins and seating including airline style seats, you will find an a la carte restaurant, cafe, bar, shops, internet access, ATM machine and night club. On the Blue Horizon you can also enjoy a swimming pool and open deck bar in the summer months. All Blue Star Ferries also now feature Goody's fast food restaurants which are Greece's equivalent of McDonalds or Burger King. Whether you the Blue Star Ferries Athens to Santorini route, the Blue Star Ferries Piraeus Amorgos ferry service, the Blue Star Ferries Piraeus Heraklion route, the Blue Star Ferries Piraeus Mykonos route or any other route from Blue Star Ferries, you are bound to have a relaxing and enjoyable journey. So what are you waiting for? How long before departure should I arrive for Blue Star Ferries? Very much enjoyed the whole Blue Star experience. 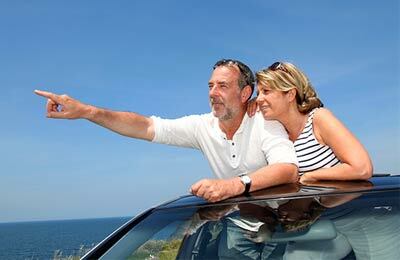 My only quibble is the cost of taking a vehicle on board which I decided against. 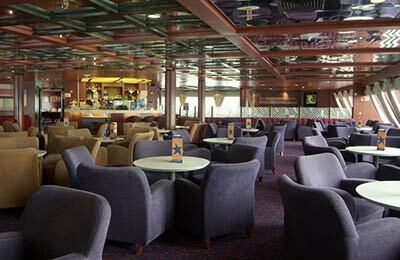 Blue star patios is an amazing ferry with 5 star facilities. Our journey from Rhodes to symi was a real pleasure as was the return journey. Very efficient company.